Blueberry picking season is still in full swing! 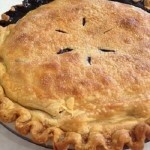 If you aren’t quite sure what to do with all of those plump, delicious blueberries after a PYO blueberries trip, we’ve rounded up a few more of our favorite recipes from Carolyn’s Farm Kitchen (http://www.carolynsfarmkitchen.com/). Try them in your kitchen this blueberry season! Preheat oven to 375. In a large bowl combine the cornmeal, flour, sugar, salt, baking powder, and baking soda, and stir to blend well. Separately whisk together the egg, melted butter, and whole milk and stir this mixture into the dry ingredients, blending just until wet & dry are combined (some lumps are OK!). 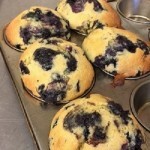 Gently fold in the blueberries and scoop batter into sprayed & lined muffin tins. Bake immediately (or freeze to bake frozen at another time) for approx. 24-28 minutes or until tops are golden brown and center no longer wet when tested. Remove from the oven and allow to cool before turning out of tins. Preheat the oven to 375. Roll half of the pie dough and line a 9” deep dish pie pan with dough overhanging edge by at least 1”. In a large bowl toss together the blueberries, sugar, cinnamon, and cornstarch and blend well. Place the filling into the pie pan, packing gently if needed. Brush the outer top rim of dough with milk and roll out the remaining pie dough into a circle slightly larger than the pie dish. Place the dough over the top of pie and tuck top and bottom edges to seal. Flute the edges and transfer the pie to a parchment-lined baking sheet. Brush top of pie with milk and sprinkle lightly with sugar. Cut 2-3 vent holes in the top with a paring knife and bake for 50-60 minutes or until the juices run thick and the crust is golden brown.